For some reason wrong songs are being played (or labeled incorrectly?) in search results. I adding a screenshot with selected song in search results and the one that's being played. As you can see, Poison by Alice Cooper is being played even though I selected Under Pressure. I was thinking about switching from Spotify to Deezer, and most people suggest just to try it out and see what's more to my liking, hence me trying deezer at the moment. 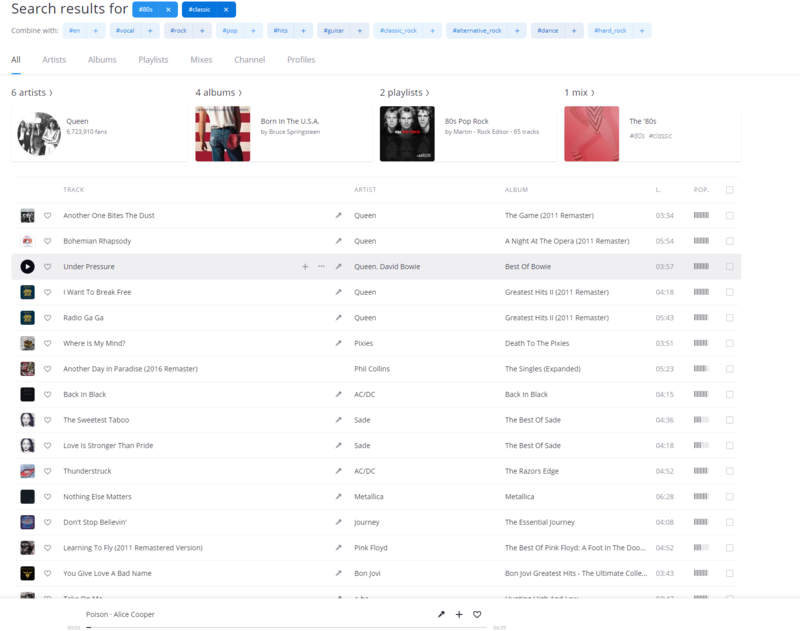 Flow feature attracted me to deezer, but so far (using desktop app) all I'm encountering are issues, which is a shame because deezer looks promising. (for now this issue and last.fm scrobbling not working with win10 desktop, but I'm positive I will find more). It would seem it's not playing the song I clicked. Why is that I wonder? Hi there, please reinstall the app and let me know if it gets better! How would reinstalling help? it's the same version (4.1.1), unless there's a different download source than https://www.deezer.com/en/download. What OS do you have on your computer right now? Is the app installed on your 'C:' drive? Windows 10, installed through windows store (since deezer download is configured to automatically use store for some reason). And yes, C drive. Have you tried using your subscription on another device like your phone, for example? The app is up-to-date, your Windows as well, I presume. Normally our current troubleshooting sorts this kind of issue - so we need to dig a bit deeper to find out if it's a bug. Does that happen with random songs and every time you use the app? Not at all. Have tried on a mobile phone, for example? I haven't, but it doesn't make any difference. I am using desktop app, and if it works on phone, it's not really relevant. Are you absolutely sure you tested this on Windows 10 (pro version to be precise) ? attached gif, to make it more clear. Note how different songs are played from what I click. Been discussing this in the background and have saved your .GIF. Before I pass it on to our devs for investigation, could you reinstall the app? We've released 4.2.4. On another note, I had asked you to check if you could use on a mobile to rule out a problem with your subscription. At the end of the day you use the platform which suits you.